The hallmark of urban areas: high density housing, big office buildings, and busy streets. It is likely that you, in fact, also live in an urban area, as more than 60% of the global population lives and works in cities. Because urban areas have so many hard surfaces where rainwater cannot enter into the ground, they produce large amounts of stormwater runoff, which in some cases can lead to flooding. However, all urban areas are not the same. Think of your downtown business district and compare it to one of your favorite places to meet friends, perhaps near an urban green space. Then there are urban residential areas and the neighborhoods on the verge of the suburbs. It is this variability and other factors tied to location of where you are that can influence weather conditions on a much smaller scale than your weather app can predict. You have surely driven somewhere and wondered, “Wow, looks like it rained here.” Imagine the feeling when a flash flood appears in front of your eyes and the warning you got was too late, or worse yet, never came. This is because flash flood warnings rely on weather radar and surface level rain measurements, both of which have drawbacks. Radar maps are updated only every 5 minutes at most, whereas rain gauges lack the spread across a city to confirm that it is actually raining in a location. Slow radar, few rain gauges, many smart cars! But in urban areas, we have lots of cars. Especially nowadays, many cars are “connected”, meaning they are smart and collect data about their environment. 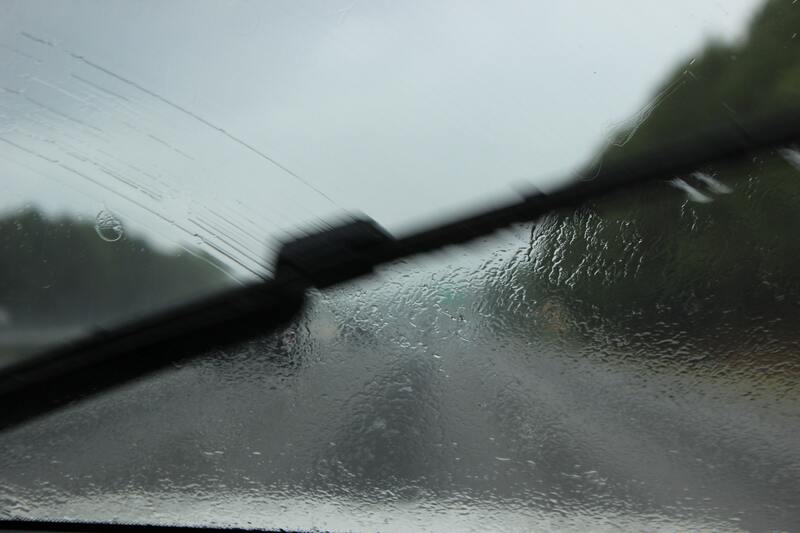 Many cars have windshield wipers that turn on automatically when it starts to rain, thanks to rain sensors. Basically, we have thousands of rain gauges driving around cities at all times. Engineers at the University of Michigan recognized this and thought of a clever way to use windshield wiper information to improve rainfall maps and flood forecasting. Comparing whether rain was detected during storms in Ann Arbor, MI, using radar, surface level rain gauges, and vehicles, the group found that cars were the best tools to determine whether it was actually raining! Cars collect data every few seconds and are spread out, improving spatial coverage compared to traditional methods. Using the information from the wiper blades, the group of researchers updated existing rainfall maps. Including the wiper data made the maps more accurate, highlighted areas that received heavier rain than the radar alone indicated, while it also pointed out areas that were predicted to have rain, but did not. The information obtained from these wiper-improved rainfall maps is truly remarkable. Not only does this technology allow for improved flash-flood prediction, as rainfall maps can be updated within a shorter time period, but the spatial resolution of the maps is higher, too. This allows for better forecasting of rainfall and flooding in urban areas where land cover can differ within just a few meters. Even along highways, this technology is useful. In the United States, most fatalities during floods are related to transportation. Perhaps the next step is to connect the smart wipers to the weather maps then back to the vehicle, which then adjusts to a safer speed and redirects your route. Windshield wiper-enhanced rainfall maps. Top maps are original maps, bottom maps are enhanced with data from windshield wipers. Figure taken from article under CC BY 4.0 open access license. Beyond driver safety, enhanced rainfall maps can also be put to use in stormwater management. Currently, many cities rely on either green spaces, sewer networks, or a combination thereof to capture rain and transport it out of the streets. Whichever combination of this grey-green infrastructure setup is used, sewers are generally overloaded during rain events. This means the wastewater treatment plant is unable to take in all stormwater and sewage and must discharge it instead, which can lead to water quality issues in the surrounding area. Smart sewer systems, developed and tested by some of the same researchers involved in the current study, help alleviate the impact on the wastewater treatment plant by controlling flows through sewer networks. By blowing up balloons in sewer pipes under a stormwater basin, the basin is forced to retain runoff until other areas of the sewer network have flushed stormwater out into the treatment plant. Once the treatment plant is ready for the runoff in the stormwater basin, the balloon collapses and allows the runoff to flow out. Armed with wiper-enhanced maps and smart sewer networks, your regional sewer district and town may be able to collaborate and prevent urban flooding in your neighborhood. Bartos, Matthew, et al. “Windshield wipers on connected vehicles produce high-accuracy rainfall maps.” Scientific Reports 9.1 (2019): 170.